This book should thrill Warhammer 40,000 fans. Collected in this single volume are all the four artbooks from the Visions series, namely Visions Of War, Visions Of Darkness, Visions Of Treachery and Visions Of Death. Those books are out of print and so this is the utmost convenient volume. This is a humongous hardcover with 416 pages. Amazon listed the number of pages wrongly at 320. 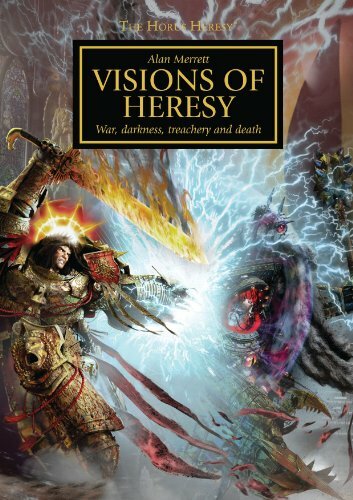 You might note that there's also another book called The Horus Heresy: Collected Visions that was released in 2007. Well, this can be considered the updated edition of that book. Text is the same. According to the author Alan Merrett, this edition includes new text and illustrations. This book is great bargain considering that around 80 per cent is filled with art. What you get are pages after pages of different warriors fighting for their cause. Each 2-page spread covers a specific subject, for example, The Great Crusade is condensed to a single column beside a big piece of art that stretches three quarters. Right at the back is an exclusive 5 pages from the first Horus Heresy graphic novel that continues The Battle of Calth. A bit too short but the art is still fantastic, just like the rest of the book. Highly recommended to Warhammer 40K and sci-fi fantasy fans.